Modulo equipaggiato con il sensore di umidita' Honeywell HIH-4030 - Misura l'umidita' relativa (%RH) e restituisce un segnale analogico in uscita. This is a breakout board for Honeywell's HIH-4030 humidity sensor. 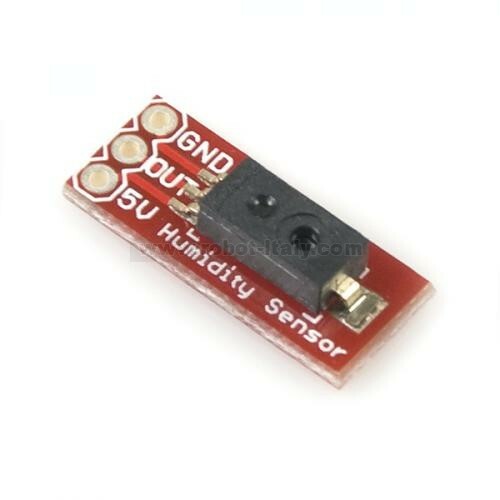 The HIH-4030 measures relative humidity (%RH) and delivers it as an analog output voltage. You can connect the output of the sensor directly to an ADC on a microcontroller; and, thanks to the sensor's near linear voltage output, the data is very easy to process. Voltage applied to the supply pins should be within 4-5.8VDC, and optimally at 5V. The sensor will typically only consume about 200μA. This product comes as shown in the picture, with the HIH-4030 soldered onto the breakout board. The pins of the 3-pin header are spaced by 0.1". Questo dispositivo misura l'Umidità' Relativa da 10% a 95% con un errore tipico di ±2%RH a 55% RH.